In Korea there is CDMA standard (code division multiple accsess) of cellular communication. I'm from Russia (where is GSM standard) and therefore can't use my phone in Korea. There are two ways to solve the problem. The first way is a rent of cellular phone (CDMA-standard, already connected). It's possible to do in Incheon International Airport or you can find such offers in the web. In the airport the rental service offer three companies : SK Telecom, KTF and LG Telecom. First of all remember, the cellphone is rented on the 1st floor (Arrival). Before you leave Korea, return the handset to the 3rd floor counter (Departure) and pay the daily rental and call charges. Inquiry (032)-743-4042. Location : 1-st floor - between Exit No. 6 and 7, 3-rd floor - behind Check-in counters L-K, C-D, E-F and in the Duty-Free area. Inquiry (032)-743-4072. Location : 1-st floor - between Exit No. 10 and 11, 3-rd floor - behind Check-in counters G-H.
Inquiry (032)-743-4019. Location : 1-st floor - between Exit No. 6 and 7, 10 and 11, 3-rd floor - behind Check-in counters B, G-H.
Not necessary to dial the "032" when at the airport. I prefer the second way. It's using IP-telephony cards with public telephone. 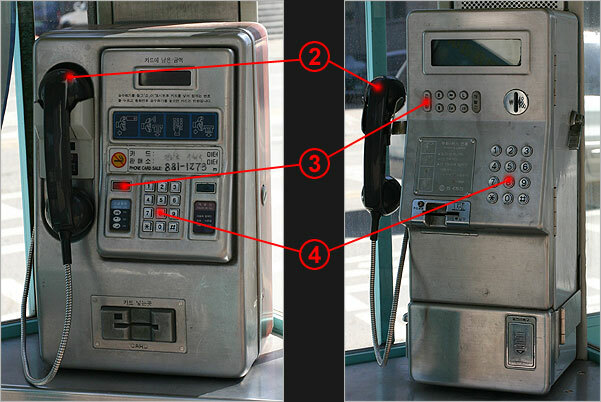 There are three kinds of public telephones: phone that only take coins, phone that require calling cards and phones that accept both coins and calling cards. If you call with IP it doesn't matter what type of public telephone to use. Public telephone boxes are everywhere. In Incheon you can buy IP-telephony in seaman's clubs or duty-free shops (for example "Moskva" or "Vladivostok" stores). The clubs and the shops are located near the gate to Incheon port (it's close to Incheon Post Office). Don't mix calling cards and IP-telephony cards. It's different things. Read instructions on backside of IP-card. Below there are approximate procedures. Buy IP-telephony card and scratch off the card number. Find public telephone box and pick up the phone. Push the red button and wait for hoot in the phone. Dial access number and wait for hoot in the phone. Dial card number and "#"-button. As a rule you should dial country-code + city-code + telephone number and "#"-button. Talking with help of IP-telephony cards is much cheaper than common way. You can use IP-cards not only with public phone but with cellular phone. This way is more expensive.